1. On 13 June 1993, the Government of the Kingdom of Saudi Arabia (hereinafter referred to as Saudi Arabia) requested accession to the General Agreement on Tariffs and Trade (GATT 1947). At its meeting on 21 July 1993, the GATT 1947 Council of Representatives established a Working Party to examine the application of the Government of Saudi Arabia to accede to the General Agreement under Article XXXIII, and to submit to the Council recommendations which may include a draft Protocol of Accession. Membership of the Working Party was open to all contracting parties indicating the wish to serve on it. In pursuance of the decision of the General Council of the World Trade Organization (WTO) of 31 January 1995, the GATT 1947 Accession Working Party was transformed into a WTO Accession Working Party. The terms of reference and the membership of the Working Party were reproduced in document WT/ACC/SAU/2/Rev.22. 2. The Working Party met on 2-3 May and 6-8 November 1996; 29-30 May and 2 and 4 December 1997; 17 and 19 November 1998; 22 September 1999; 5 April and 17 October 2000, under the Chairmanship of H.E. Ambassador Mr. J. Weekes (Canada); and on 23-24 October 2003; 25 February, 29 April and 16 June 2004; and 11 and 28 October 2005, under the Chairmanship of H.E. Ambassador Mr. Munir Akram (Pakistan). 3. 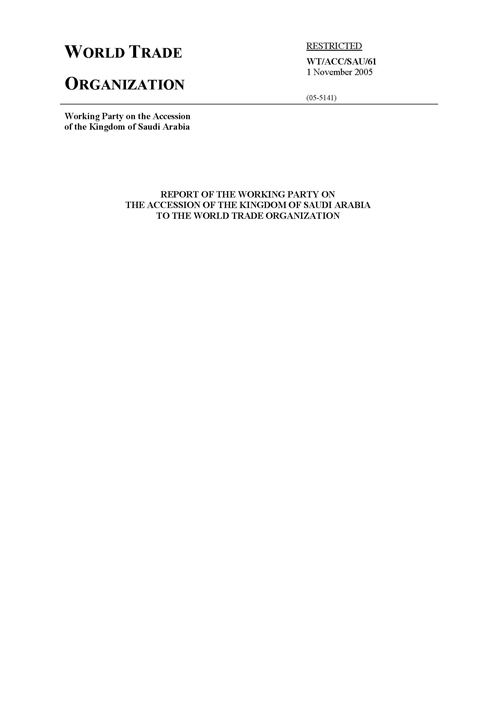 The Working Party had before it, to serve as a basis for its discussions, a Memorandum on the Foreign Trade Regime of Saudi Arabia (L/7489) and the questions submitted by members on the foreign trade regime of Saudi Arabia, together with the replies thereto (L/7645 and Add.1; WT/ACC/SAU/3; WT/ACC/SAU/6, Add.1-3 and Add.3/Corr.1; WT/ACC/SAU/8 and Corr.1; WT/ACC/SAU/10; WT/ACC/SAU/13, Add.1, Add.1/Corr.1 and Rev.1; WT/ACC/SAU/29, Add.1-4, and Corr.1 and 2; WT/ACC/SAU/35 and Corr.1; WT/ACC/SAU/44; WT/ACC/SAU/46; and WT/ACC/SAU/47 and Corr. 1). 13. The representative of Saudi Arabia stated that the Saudi Arabian Monetary Agency (SAMA) is charged with carrying out the Kingdom’s monetary policy. The objective of monetary policy is the maintenance of domestic price and exchange rate stability. To promote domestic price stability, SAMA takes measures to ensure that the growth in domestic liquidity is broadly in line with the growth and availability of goods and services in the economy and that the banking system is endowed with adequate liquidity so that the credit needs of all the sectors of the economy are adequately met. To maintain the stability of the fixed exchange rate, SAMA monitors the Riyal market to ensure its smooth functioning and takes corrective measures if there are any disruptive activities. SAMA has been highly successful in achieving these objectives over the years. Domestic prices have remained highly stable for years, with an average annual increase in the cost of living index of less than one per cent per annum over the last two decades. The exchange rate of the Riyal vis-à-vis the U.S. dollar has also been maintained at Saudi Riyals (SAR) 3.75 per U.S. dollar since 1986. The sustained stability in domestic prices and the exchange rate over a prolonged period of time has greatly facilitated the growth of the Saudi economy. 14. The primary objective of Saudi Arabia’s fiscal policy was to encourage economic growth and diversification of the economy and improve living standards through providing education and other public services. Diversification of the economy would further integrate Saudi Arabia into the global economy. He further noted that the preparations for Saudi Arabia’s accession to the WTO had further improved the climate for foreign and domestic investment and trade. The major source of the Kingdom’s revenues was oil, which accounted for roughly 80 per cent of total revenue; non-oil revenue consisted of corporate taxes, customs duties and miscellaneous administrative fees. 15. In response to requests for information on the national budget, he further noted that revenues for 2004 were SAR 393 billion; expenditures had been projected to be SAR 295 billion, but, due to emergency expenditures, actual expenditures were SAR 336 billion; the remaining revenue was allocated to retire part of the public debt. In the 2005 budget, total revenues were projected at SAR 280 billion and expenditures also were projected at SAR 280 billion, including SAR 75.5 billion for new projects. The appropriation for the 2005 budget included appropriations for the main development and public service sectors as follows: education and manpower development – SAR 70.1 billion; health and social affairs – SAR 27.1 billion; municipality services – SAR 10.65 billion; transportation and telecommunications – SAR 8.85 billion; and water, agriculture and infrastructure – SAR 19.2 billion. 16. Some members of the Working Party requested information on how “Zakat” applied to Saudi Arabian citizens and how income tax applied to foreigners. These members noted that it appeared that the Zakat and income tax were applied in such a manner that foreign investors typically carried a higher total tax burden than Saudi citizens. The representative of Saudi Arabia stated that there was a general misunderstanding about Zakat and income tax. It was not correct to say that the tax burden (as distinct from the nominal rate) was higher for foreigners than for Saudi nationals or Saudi companies. The percentage of corporate income tax applied to a non-Saudi was 20 per cent of net profit, while the percentage of Zakat may reach or even exceed 100 per cent of net profit. Also, he reported, it was incorrect to say that all Saudi persons are subject only to Zakat; just like non-Saudis, Saudis engaged in natural gas investment or oil or hydrocarbons production activities are subject to income tax. A non-resident Saudi person who did business in the Kingdom through a permanent establishment and earned income from a source within the Kingdom was subject to tax. Zakat was a religious duty, and because its rate and basis of collection was prescribed by religion, it could not be altered. – Zakat was applied at a flat rate of 2.5 per cent on the net worth of Saudi natural persons, wholly Saudi-owned companies and Saudi partners in joint ventures (except for rain-fed agricultural products and irrigated agricultural products, for which the rate was 10 per cent and 5 per cent, respectively). – The base for levy of Zakat, i.e., the assessable amount, was not the income or profits of the assessee. It was much larger and included: capital, retained earnings, reserves and net profits (it did not include fixed assets, investments in other companies, losses carried over from previous years and losses for the fiscal year). There were no exemptions. – Zakat was payable even if the company did not make a profit. – Zakat was payable even if the company ceased its activities; it was non-payable only when the company was liquidated. – Non-payment of Zakat was punishable by seizure of assets and prohibiting the non-payer from leaving Saudi Arabia. i. Saudi Arabian Basic Industries Corporation (SABIC): Established in 1976, SABIC remained the main petrochemical producer in Saudi Arabia and the major catalyst producer for a number of downstream petrochemical products. SABIC is the largest non-oil company in the Middle East, with its industrial complexes operated by 16 affiliates. In 2002, SABIC’s production capacity reached over 40 million metric tons. SABIC is also a producer of methanol and MTBE. Eight of SABIC’s production companies are joint venture partnerships with international companies, including such firms as ExxonMobil, Shell Oil, Hoechst-Celanese and Duck Energy. SABIC is a partner in three joint ventures in Bahrain and has two manufacturing plants in Germany and Holland. SABIC has an ownership interest in the Saudi Arabian Fertilizer Company, which is an exporter of urea, granular fertilizer and urea fertilizer, and is 57 per cent privately owned. SABIC also fully owns Saudi Iron & Steel Company (Hadeed) which is engaged in the manufacture of a variety of steel products. SABIC’s paid-up capital is SAR 20.0 billion. Seventy per cent of SABIC is owned by the Government; the remaining 30 per cent is privatised. The company has been identified for further privatisation, but there is no timetable over which privatisation would occur. The Government appoints the Chairman of the Board, the CEO and three other Board Members out of a total of seven. The other two Board Members represent the private sector and are nominated and selected by the shareholders’ general meeting. The Government is represented on the Board, but does not play any role in setting company policy or in making operational decisions. SABIC conducts its business based on commercial considerations. It does not enjoy any special or exclusive privileges. There are no legal impediments to competition with SABIC. ii. Saudi Telecom Company (STC): Saudi Telecom Company had been established following the decision of the Council of Ministers to transfer the telecommunication division, then operated by the MOPTT, to a public joint-stock company. STC had transformed itself, in a relatively short time, into one of the most technically advanced telecommunication companies in the Middle East region, offering a comprehensive range of services and products that matched other major international telecommunication companies. Thirty per cent of STC shareholding comprising 90 million shares of SAR 50.00 each has already been sold to the general public (20 per cent) and the General Organization for Social Insurance (GOSI) and Pension Fund (10 per cent). STC’s paid-up capital amounts to SAR 15 billion. The Government owns 70 per cent of STC shares. There is no timetable over which further privatisation would occur. The Board of Directors of STC is headed by a representative from the private sector. Five of nine Directors are government officials, three are from the private sector and one is a member of the Shoura Council. The Government does not play any role in setting company policy or in making operational decisions. STC conducts its business based on commercial considerations. The representative noted that after 2006 no legal impediments to competition with STC will remain as per Saudi Arabia’s Schedule of Specific Commitments. iii. Saudi Electricity Company (SEC): The Saudi Electricity Company, a Saudi public joint-stock company, was incorporated by Royal Decree M/16 of 6.9.1420H (14 December 1999) by merging all the electric power utilities companies and the General Electricity Corporation (100 per cent owned by the government) and its regional projects of several Government controlled regional electricity corporations into one entity that commenced operation on 5 April 2000. Its objectives, as set forth in its articles of incorporation, include electric power services in Saudi Arabia; investment in electric power projects within and outside Saudi Arabia; import and export of electric power across Saudi Arabia’s borders; investment in projects for supply of fuel to its wholly or partially owned subsidiaries and carrying out and support of research for service enhancement, power conservation, performance upgrade, environment protection and cost reduction. About 19 per cent and 7 per cent of the company’s shareholding is owned by private investors and Saudi Aramco respectively. The paid-up capital amounts to SAR 41.7 billion. About 74 per cent of shares are held by the Government. The company was identified for privatisation on 11 November 2002, but no timetable has been established over which privatisation would occur. The Government appoints the Chairman of the Board of SEC, who is the Minister of Water and Electricity. Of the remaining eleven Directors, six are from the private sector and five are government officials. The Ministry of Water and Electricity is not responsible for regulating SEC. The regulating authority for SEC, the Electricity and Cogeneration Authority (ECRA), is not represented on the Board of SEC. The Government does not play any role in the setting company policy or in making operational decisions. SEC conducts its business based on commercial considerations. It does not enjoy any special or exclusive privileges. There are no legal impediments to competition with SEC.